JumpStart Wii Review: Learning is fun! Seriously. The kind people of Knowledge Adventure recently sent me two of their new Wii games for my girls to play and for me to give my honest review. The first one they sent is JumpStart Pet Rescue, an educational game specifically designed for 3-6 year olds. JumpStart Pet Rescue is very similar in design to the JumpStart Virtual 3D World games, having some of the same features you would find on the web, such as the ability to create a Jumpee and earning stars and coins for games you play. The game also takes place in Adventureland, which is one of the worlds from the online games. 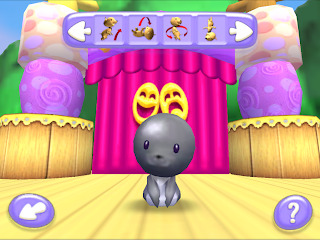 However, with Pet Rescue, a Wii Remote is used to navigate your way around, making the games much more interactive. If your children are already familiar with a Wii, they will have no problems learning to use the remote to play on the Wii. If playing on a Wii is all new to your child, JumpStart makes learning to use the remote a snap - the cursor is big and easy to see, and direction reminders are given frequently (orally) during the game in case your child isn't sure what to do next. The child also has the option of using just the Wii remote to navigate, or adding the Wii Nunchuck, which more experienced Wii users tend to enjoy. At ages 6 and 8, both of my girls found Pet Rescue quite enjoyable, even if it was a bit below their level. They loved creating their "Jumpee" (which is similar to a Mii) and loved exploring and trying to find the "lost pets." There are two modes of play, story mode and explore mode. Story mode is mission based - you have to complete mini missions in order to unlock different worlds and "find" the missing pets. My girls love this type of play and couldn't wait to see which pet they would find next. Even though the game was easy for them, they didn't care because there was so much to do to entertain them along the way. One of their favorite parts of the game is a big slide, which they could do over and over (and over and over) and laugh every. single. time. They also loved finding and caring for the different pets. If your child has a shorter attention span, then explore mode is the place to be. The mode allows you to go to the different worlds, without having to unlock them first, and explore to your heart's content, play games, play with the pets, etc. My girls never even wanted to try this mode, they enjoyed story mode so much! The second game we received was a pre-release copy of JumpStart Escape From Adventure Island, which is geared towards children ages 5-9. The game is more of an adventure, which the girls really liked. The mission of the game is to fix a balloon that crashes on the island. In order to "escape" your child needs to play learning games, and earn sand dollars, which will in turn help her to buy helium tanks to fix the balloon. The games are fun, yet challenging, and while playing, your child can practice math, reading and critical thinking skills. As in Pet Rescue, you start the game designing a Jumpee, and the girls spent quite a bit of time doing this. They couldn't wait to have their turn to design their own. They also liked designing a tree house, and then exploring around it. Kiki and Boo are both have active imaginations so this type of play is right up their alley. I love that there is a wide range of age appropriate games for them to play. Boo, who is in first grade, can practice her addition and subtraction, while Kiki, a third grader, can also start working on her multiplication and division, skills she will be learning in school this year. Escape from Adventure Island also has two modes - story mode and practice mode. Once again, Kiki and Boo spent much of their time in story mode. Because this game is more on their level, I do like that there is practice mode, so they can play the learning games, which is certainly a fun and interesting way of reinforcing the skills they are learning at school. 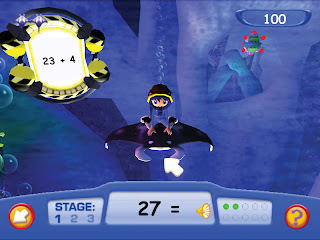 The game is similar to Pet Rescue in that the child has to complete missions to advance, but the learning games were much more age appropriate and even difficult at times for them to complete. The girls liked Escape from Adventure Island the best, because it was more age appropriate and challenging for them. Their favorite part of the game was exploring the underwater world known as the Scuba Hub and playing The Fashion Show game. They loved picking out the different outfits and following the directions to move their Jumpee around the stage. I only have a few negative things to say about either of these games. At times the navigation with the Wii remote is tricky, and if your child has never played Wii before this can take some getting used to. The games sometimes are slow to load, but they do have characters pop onto the screen during loading time which helps to entertain even the most impatient child. There is also one game in the Escape from Adventure Island game called Foot Frenzy that my girls got particularly frustrated with. The game is similar to a Dance Dance Revolution type game, except instead of moving feet you are moving the remote which often times didn't seem to respond to the motions the girls were making. I even tried it and had a difficult time with it. The only other downside to the games is that they are one-player games. My girls love to play games together and were a little disappointed they couldn't do that with these games. However, they still had fun watching and interacting with the child that was playing the game and were surprisingly patient waiting their turn. The advantage to this is there is no competition between the two of them, thus less frustration for me everyone involved. All in all both games are great. 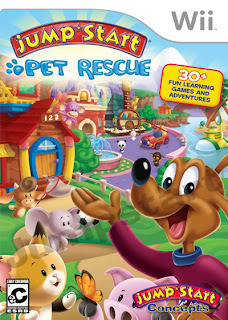 I love that Pet Rescue is geared towards preschoolers since there are so few Wii games that are suited for this age. So many families play Wii together but often times the little ones are left out. This game uses very basic Wii motions, which allows a child to get familiar with the game without having to master remote skills as well. 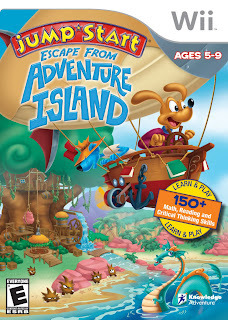 Escape from Adventure Island is more challenging and suited for older children, but is simple enough to navigate that it doesn't matter if your child is a Wii novice or expert. The contest is live now through 11/16/09. We want to hear how your family uses imagination to escape the everyday and turn life into an adventure! Tell us your story for a chance to win. 3 GRAND PRIZE WINNERS will receive a family Escape Pack (over $1000 value)! If you'd like to find out more and enter this fantastic giveaway click HERE. Good luck! Thanks to the fantastic people at Knowledge Adventure for supplying me with copies of these games to review. All opinions of this game are my own (and Kiki and Boo's too).